From left, Brian Stump; Gene Theodori; Melinda E. Taylor, executive director for the Kay Bailey Hutchison Center for Energy, Law, and Business; Danny Reible, and David Allen present “Environmental and Community Impacts of Shale Development in Texas” at the 2017 APE Annual Technical Conference and Exhibition in San Antonio, Texas. TAMEST is a consortium of Texas-based members of the National Academy of Sciences, Engineering, and Medicine and the state’s Nobel laureates. The task force within TAMEST examined six areas affected by shale development in Texas—geology and earthquake activity, land resources, air quality, water quality and quantity, transportation, and economic and social effects. “The strength of the TAMEST study was bringing people with different perspectives together to try to come to an understanding of each of the task areas,” said Brian Stump, the Albritton Professor of Earth Sciences at Dedman College of Humanities and Sciences at Southern Methodist University. Stump, along with other members of the task force, spoke at a special session at the 2017 SPE Annual Technical Conference and Exhibition. 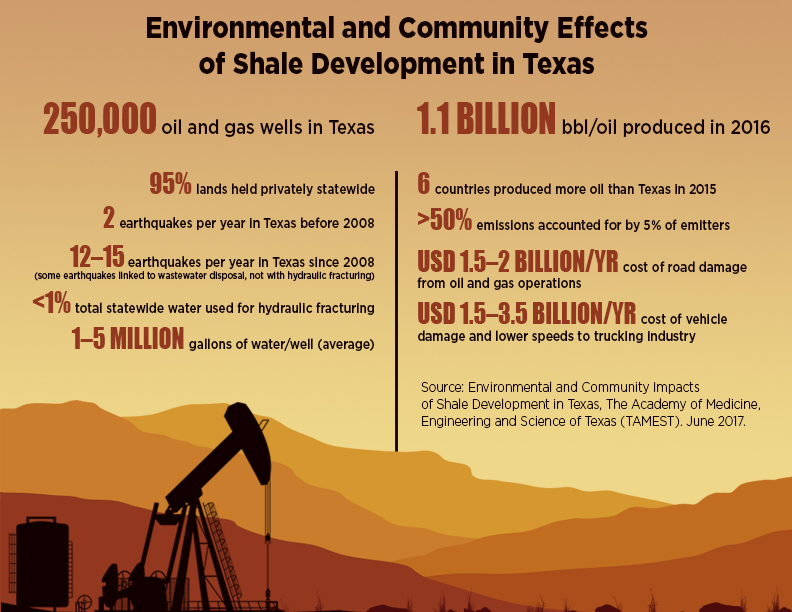 TAMEST members say they hope the report can serve as a touchstone for the public and policy makers to examine and understand the benefits, challenges, and effects of shale development in Texas and make informed decisions about future development. “It is hoped that this report will allow Texans and other states and nations to learn and benefit from the Texas experience,” said Christine Ehlig-Economides, chairperson of the TAMEST task force. Gathering data from a wide range of technical studies, the TAMEST task force has attempted to present the information in a way that is accessible to the public. The report points to the growing number of earthquakes in the state. According to the report, Texas recorded approximately two earthquakes per year before 2008. Since then, that number has risen to approximately 12–15. Some of these, the report says, are linked to wastewater disposal. “We know there are earthquakes in Texas and that some of them have been linked to oil and gas operations. But, what remains unknown is a complete understanding of the physics of that process that can lead to these earthquakes and understanding the degree we can mitigate or eliminate them,” Stump said. Addressing the increase in temblors, the state plans to raise the number of monitoring stations from 18 to 43. Water-disposal wells now must also receive approval from regulators. Studying the effect shale development has on the land is hampered by the fact that 95% of the land in Texas is privately owned. Nonetheless, the report identifies two species that are threatened by shale development—the dunes sagebrush lizard and the lesser prairie chicken. While the report says that more studies are needed, it recommends limiting shale development’s effect on land by using horizontal wells to help drill multiple wells from a single pad. Most of the air pollution that results from shale development comes from a small number of so-called “superemitters.” According to the report, for most sources, more than 50% of emissions come from approximately 5% of emitters. “It’s been known for decades in the air-quality community that a small subpopulation of vehicles on the road dominate emissions,” said task force member Dave Allen, the Melvin H. Gertz Regents Chair in Chemical Engineering at The University of Texas at Austin. Despite the known information on the source of air pollution, limited information exists concerning exposure to toxic emissions and their effect on health. The report, therefore, strongly recommends targeted research in that area. Regarding water quality, the report points out that the greatest danger to drinking water comes from surface leaks and spills, not from subsurface activities. And, while water usage has created many headlines, hydraulic fracturing, according to the report, accounts for less than 1% of the total water usage in Texas. The report encourages continued research into ways to use poor-quality water in the process instead of fresh water.